Living in Thailand for many years now, I've developed a few pet hates. Probably top of my list is the Tuk-Tuk driver, especially the Bangkok kind. Not only do their vehicles choke the atmosphere with the smoke that belches from out of them, there is the incredible noise pollution as well - a Tuk-Tuk can sound like a small tank coming down the street and can vibrate small buildings as it cruises by - but the drivers' of these machines from hell can also double as touts, a loathsome breed that can pester the life out of you. - up there with the Elephant, the Buddhist monk, the Buddhist temple, the Ladyboy and the Hill-tribe lady. It costs about 250,000 Baht to buy one. 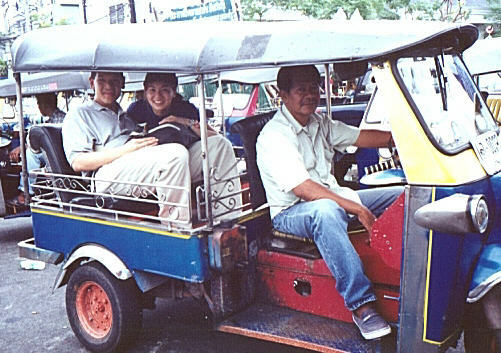 Tuk-Tuks are operational all over Thailand, and a ride in one is a must do for most tourists visiting Bangkok. Fares have to be negotiated, so haggling is inevitable. However, as I said, you have to watch yourself with the drivers' of these three wheeled, open sided vehicles. 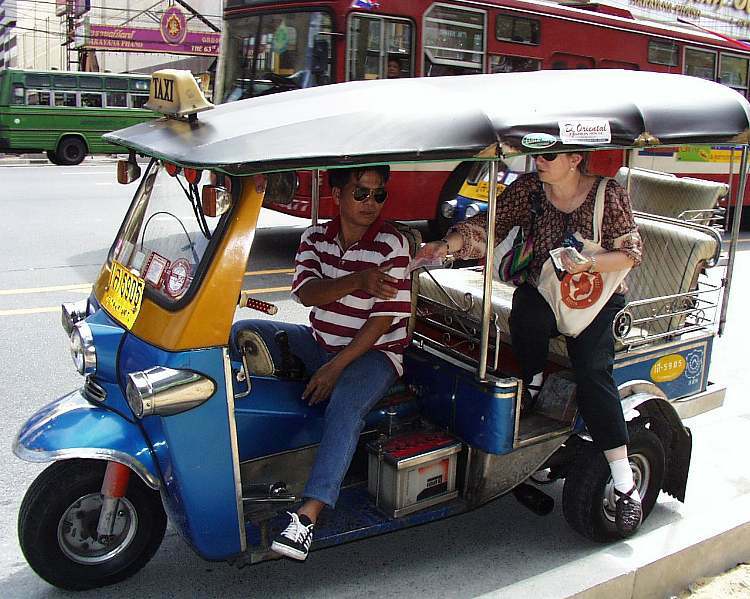 Beware of Tuk-Tuk drivers offering incredibly cheap, sometimes as low as 20 Baht for 1 hour, sightseeing tours of Bangkok. This is just a ploy to get you to a shop or factory, where you will be pressured into buying overpriced, sometimes even fake, goods. Be careful if you do go along, the people in these places can get nasty if you go and don't buy what's on offer - no Thai smiles then, I can assure you. A bit of sensible advice - if needed, in Bangkok, always flag a Tuk-Tuk down, never take a ride in one parked in the road. The driver of the parked Tuk-Tuk is almost certainly touting, just waiting the chance to pounce and lead you on to a scam. 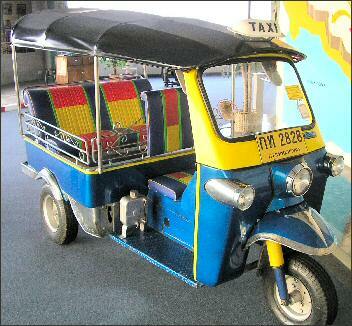 These days, a metered taxi is about the same price as a Tuk-Tuk, anyway, and a lot safer as well. Some taxi drivers can be a bit awkward, but they are generally more trustworthy than Tuk-Tuk drivers. One story about Tuk-Tuk drivers and scams - in Bangkok one afternoon, I found a temple I hadn't seen before. As I was walking around the temple's courtyard, a Tuk-Tuk roared into view, dropped off two western blokes and shot off again, double quick. The two guys approached me and asked whether this was Wat Pho, one of Bangkok's most famous temples, and a magnet for tourists. I had to say it was a far lesser temple, just for locals and not famous in any way. The pair looked puzzled. They had asked the Tuk-Tuk driver to take them to Wat Pho. I told them it's about 3 miles away, and could take an hour to get too given possible traffic jams. I then explained to them the driver brought you here because he wanted your fare, and didn't want to take you across town to your preferred destination, as he reckoned you were tourists and probably wouldn't know the difference between one temple and another. They had also paid over the odds for the fare - in other words, he scammed them, not once but twice! Welcome to Thailand, I said a broad smile on my face. The guys raised a half-smile in response and looked around the temple before heading back to the street, just two more innocent victims of the Thai Tuk-Tuk drivers' corrupt modus operandi. The "wind up" - a foreigner strikes back. One of my friends, a Yank, like me, hates Tuk-Tuk drivers. He has an amusing way of getting at them. He lets the driver attract his attention thinking he has a fare, and then starts the wind up. The driver would invariably offer a cheap tour of Bangkok. My friend, being savvy, knowing that this would probably lead to a scam would listen, but not get into the Tuk-Tuk. He'd then ask the driver if he would take him somewhere else in Bangkok, but would always, with his exaggerated American drawl, mispronounce the destination so the driver would never quite understand him. My friend would then take the driver through a whole list of Bangkok place names, slowly, all carefully mispronounced, the driver getting more and more wound up as my friend went on. Then, as the driver reached a fever pitch of frustration, and went to pull away, my friend would hit him with the punch line - "Hey, I know where you can take me - Chiang Mai!" - That's 300 miles away, by the way - The Tuk-Tuk driver would, giving my friend an angry look, then drive off, having wasted 10 or more minutes of his valuable time. Try it on for a laugh, but be careful. Just one more thing about Tuk-Tuks - these days, with all the publicity about the environment, and given the vehicles' deafening noise and belching smoke that both pollute the atmosphere, strike a blow for the future of the world and its people - including you, the visitor to Bangkok - and never ride in a Tuk-Tuk. 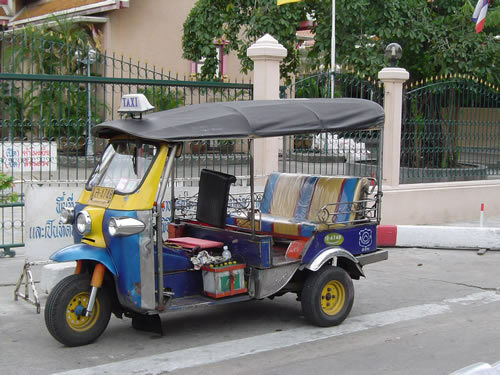 The Thai authorities are going to have to make some tough decisions soon about Bangkok's pollution and environment including Tuk-Tuks and other transport, so boycotting them just makes sense - use a taxi, the metro or the sky-train, if possible - the Tuk-Tuk backlash starts here.